Aside from sleek design, it has a reversible seat, adjustable foot rest, telescoping handle bar, double parking brake, and one-hand recline. It has easy fold and one-touch AUTOMATIC unfolding! Very innovative and inspiring. The maneuverability on the Moodd is amazing. With 12″ rear wheels and 7″ front wheel, this buggy can easily handle grass, mulch or gravel with no problems. The Moodd is a 3-in-1 travel system that can accommodate a child from birth and up to 50 lbs. You can turn it into a travel system by removing the seat and replacing it with an infant car seat or turn it into a pram by replacing it with a carrycot/bassinet (sold separately). I gave this stroller only 3.5 out of 5 stars because it’s heavy(33 lbs), bulky, has just ok canopy, lacks storage, has no peekaboo window in the canopy, and a medium size basket. Also, the foot rest is very short making it comfortable only for kids up to 2 years old. For all this money, I would like to see a better foot rest. Honestly, although it is NOT a practical stroller, the Britto edition blew me away. It’s so pretty, that you forget about all the missing functions and just want to have it. It’s just like those uncomfortable high-hill shoes that you know you can’t walk in very far, but you just have to have them. LOL. I have a lot of those in my closet. The lowest price I found for the Moodd model is $699 on Amazon (free shipping/free returns and no sales tax). The Britto edition can be purchased for around $899. The bumper bar is the only accessory that comes with the stroller. Everything else has to be purchased separately. -Medium size canopy. It has a medium size canopy with a pretty heart print on the side. It won’t shade your child from the morning or evening sun. It’s attached to the back of the seat and does NOT convert into a ‘floating canopy’ that I love so much. It also does NOT have a peekaboo window. How can you not see your child? I look at my baby girl all the time! I always want to know what she is doing and where she is looking. -Telescoping handle bar. The handle bar goes from 37″ all the way up to 41″ from the ground up. You can easily adjust it by pressing on the gray button in the middle of the handle bar. -Reversible seat. The seat is 14″ wide with 21.5″ seat back and a measurement of 24″ from the bottom of the seat to the top of the canopy. Doesn’t it look like an egg? The seat is made out of water and dirt repellent fabric, so it is very easy to clean. It has a one-hand recline with 3 recline positions: upright, half-way, and fully flat. Although, it says it can accommodate a child from birth and up to 50 lbs, I wouldn’t put a baby into the seat until he is at least 3 months old. This seat is reversible, so your baby can face you or the world. To reverse the seat, pull on the levers on both sides of the seat, lift it up, swing it around and lock it in place. Easy! Don’t forget to take out your child first. LOL. It reclines the same way when reversed. Note: you will need to make sure the seat is facing out before folding the stroller. The back of the seat doesn’t have any storage, but has the same beautiful design as the frame. -5 point harness. It has 5 point padded adjustable harness with a center release button that is very easy to unlock. Now, locking it is like putting a little puzzle together. (The stroller on my photo is missing the padding). -T-bar/bumper bar. INCLUDED! This unique looking T-shaped bumper bar reminds me of the roller coasters. I personally like to have a bumper bar that goes all the way around, so that my daughter Sophia has some support if she decides to lean to the side. This bumper bar is removable, but not swing away. -Adjustable foot rest. It has adjustable foot rest that goes up and down. The foot rest is not connected to the seat all the way, so you will not get additional flat surface for your baby’s legs. It also does NOT extend. It’s a pretty short leg rest that will be ok till your child is about 2 years old. After that, you will need to buy a new stroller. LOL. -Medium size basket. The basket on the Moodd model is ok. It’s not very deep, but is easily accessible and can hold up to 11 lbs. You will be able to fit a large diaper bag, but nothing else. If you like to go grocery shopping with your stroller, be ready to leave the store with just a few items. -Wheels. The Mood rolls on three wheels with 12″ air filled wheels in the back and 7″ hard rubber double front wheel. The front wheel is swivel, but can be locked straight for more stability. These wheels will be able to tackle any tough terrain like uneven pavement, playground mulch or gravel with no problems. I absolutely love the wheel design on the Britto model! The red color makes it very artsy. -Parking brake. It has two foot pedals in the back, one for locking the stroller and one for unlocking it. It is flip-flop friendly. -Easy fold, easier unfold. The fold on the Moodd will require both hands. First, make sure the seat is facing out. Next, pull on two levers on both sides of the frame and push the stroller down until it folds. That’s it! There is an automatic lock. Unlocking the stroller is even easier. All you have to do is unlock the automatic lock and the stroller will unfold ITSELF! The Moodd model is a little bit bulky and is heavy weighing 33 lbs. To make it more compact you can remove the seat and the rear wheels. 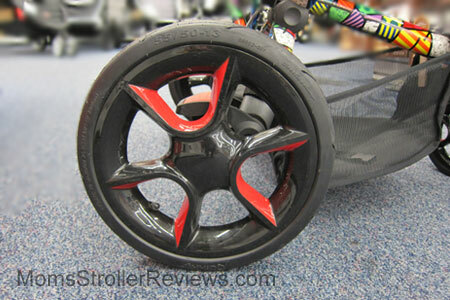 The folded dimensions of the stroller with the seat are 31″L x 12″H x 26″W. -Very heavy! It weighs 33 lbs. This is a lot for a single stroller. I have back problems as it is, so I wouldn’t be getting Moodd stroller anytime soon. LOL. -Bulky. This stroller will not fit in any trunk. You might have to remove the rear wheels to fit it in. -Short foot rest. This foot rest is a disappointment. It adjusts up and down, but since it is not connected to the seat all the way, you won’t get any flat surface. Also it is very short and will not work for a child older than 2 years. -Small canopy. This canopy is a deal brake for me, since it provides very little shade. I like when the canopy goes down all the way to the bumper bar. I think Quinny can solve this problem by just adding a ‘floating’ canopy option. -No peekaboo window. I noticed that many luxury strollers don’t have a peekaboo window…. I wonder why … I always want to see what by baby Sophia is doing so it is a must-have feature for me. -Small basket. The basket is accessible, but small. It is just not deep enough to fit anything aside from a diaper bag. -Lack of storage. Aside from the basket, there is no additional storage for smaller items like keys or wallet. It would be great to have a small pocket in the back of the seat or on the side of the basket. -Lack of accessories. There is no cup holder, nor rain cover included. You have to buy everything separately. Baby Gizmo as always has a great video review. If you want to see how Moodd model compares to other Quinny strollers here is a great comparison chart. Quinny has 2-year warranty from the original date of purchase and you have to be the original owner. Here is more information on the warranty. For 2013 the Moodd is available in eight colors: pink passion, black devotion, black irony, blue reliance, green courage, natural delight, red envy, blue defiance. It has black or white frame options. There is also Moodd by Britto model that was created in collaboration with a famous artist Romero Britto. It comes in three colors with an artistic print on the frame. The colors are: blue britto, red britto, and black britto. Love it! The Moodd has following accessories that can be purchased separately: footmuff, bassinet ($160), cup holder ($25). 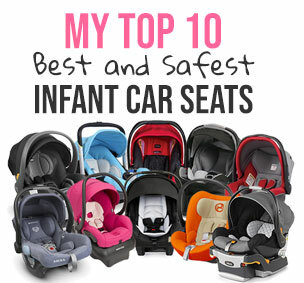 My favorite place to buy strollers and a lot of other baby items is Amazon. It usually has the lowest prices, free shipping, free returns and no sales tax. How great is that? You can get Quinny Moodd in one of the eight beautiful colors for $699.99 on Amazon (free shipping/free returns and no sales tax). The Britto edition can be purchased for around $899. I was not able to find any good sales on this luxury stroller.